Fall is well underway, and the temperatures around here last week certainly felt like it. My husband and I took our daughter to a local orchard to play and pick out pumpkins on Saturday, and it was every bit of 65 degrees: the perfect day to enjoy homemade hot apple cider! 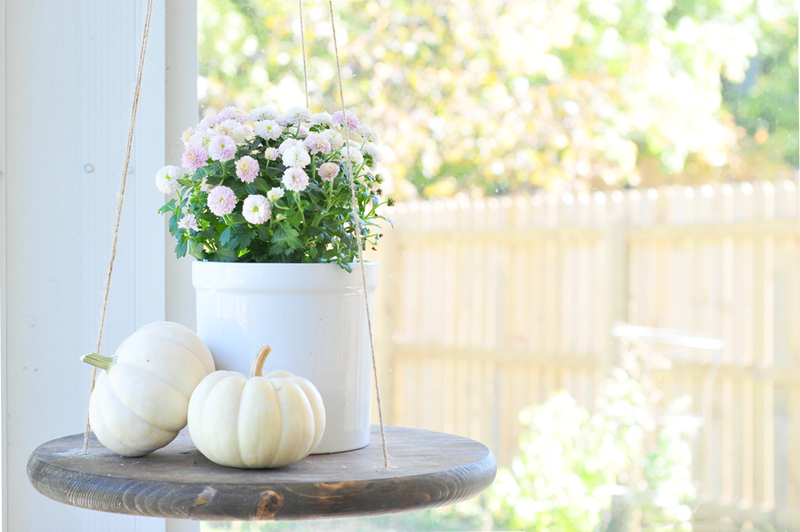 Of course, we’ve had fall fever for a while, introducing fall and showing you some sneaks of our porch. 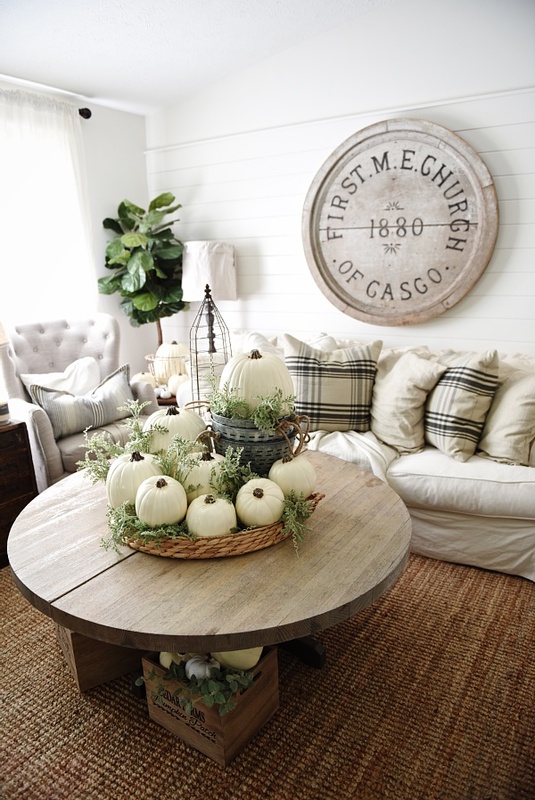 Now that we’ve settled in to the season, we’re incorporating fall and harvest decor throughout the house. I might have gone a little crazy with the pumpkins and mums this year, but they are so pretty!!! And when Lowe’s has a 5 for $5 deal going on, you can’t just ignore it! Well, I can’t anyway. Amanda and I planned out our fall posts and let me just tell you, I am so excited for what is coming up! To get us in the mindset for this month’s fall theme, we’re kicking off with a home decor tour of sorts. I’ve chosen some of my favorite inspirational fall spaces from fellow bloggers and put them all together to create the ultimate fall home tour to inspire us all to get decorating! I love a blue door. Sure, I’m biased because mine is blue, but I just love how it stands out in the sea of neutral doors. What’s not so easy to do? Decorate seasonally around a colorful door. 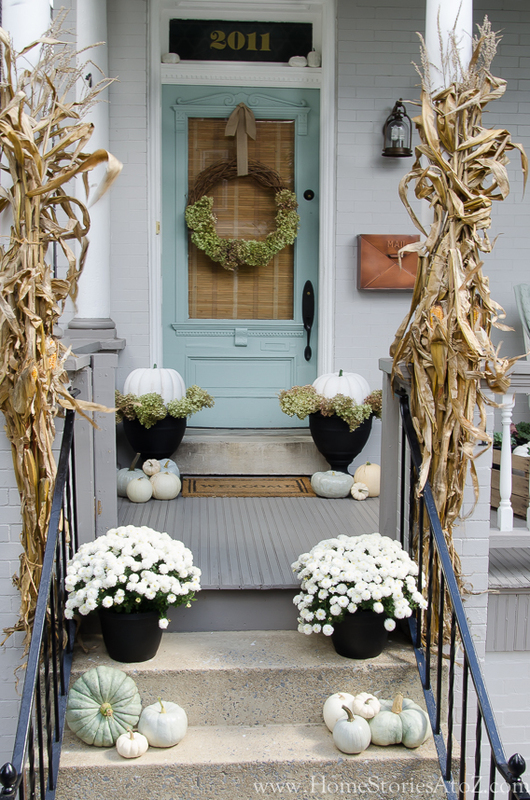 Thanks to white mums and pumpkins, though, that got a whole lot easier for fall, and Home Stories A to Z has one of the most beautifully festive neutral porches I’ve ever seen! You can purchase planters and corn stalks at Lowe’s along with flat pumpkins and faux pumpkins. 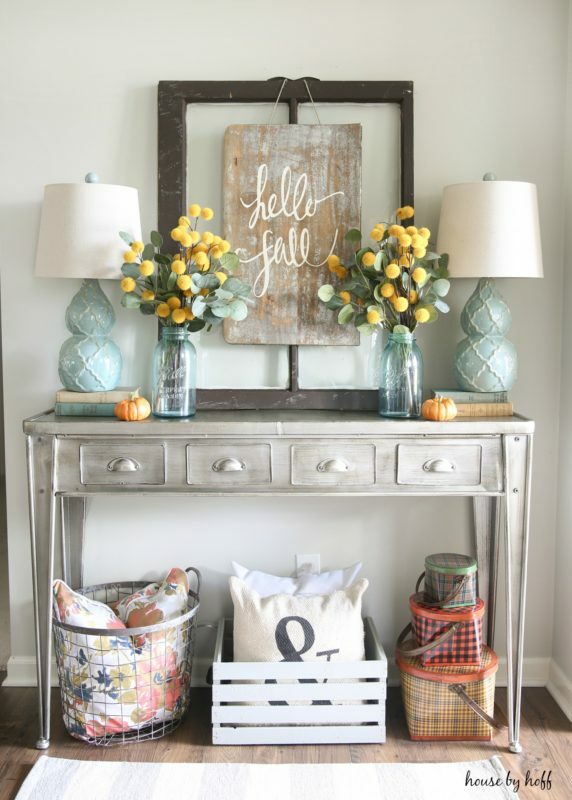 Whether you have a small entry or a large one (mine is tiny), you can still add a fall vignette that welcomes guests into your home. It can be something as simple as a sign on the wall, a console table or a cute seating area like this one from Home by Heidi. 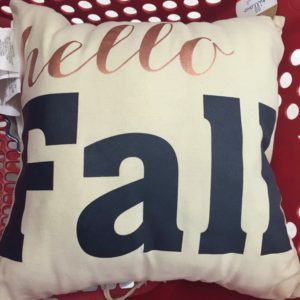 Target has some great fall and harvest pillows in the dollar spot area right now, like this one! 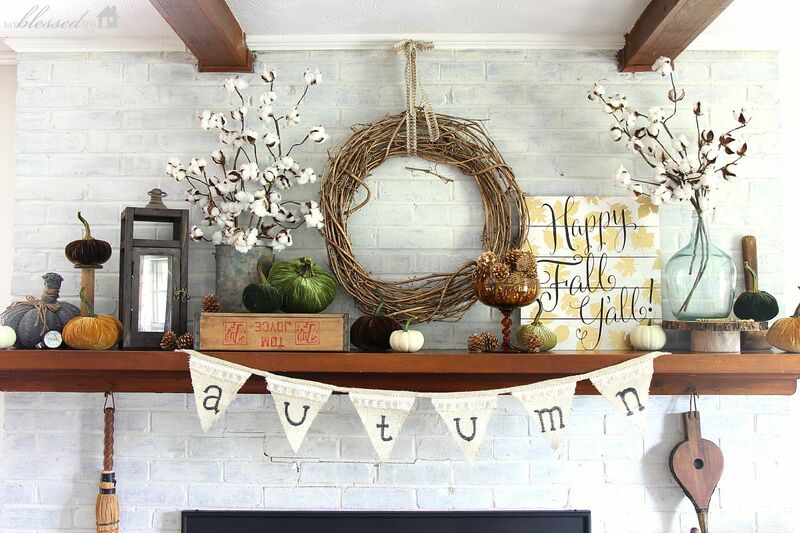 There are probably a million different fall mantle photos blowing up my Pinterest feed right now, and all of them are so cute! I stumbled on this one earlier this week, though, and it just blew me away. It’s bright and pulls some of that muted turquoise in while still feeling festive and incorporating some potential DIY projects, too, like the banner and, of course, it uses mini pumpkins which are my favorite! Whether you love to entertain or your dining room is only used for members of your household, the dining table is a perfect fall canvas! Once again, Liz Marie hit the nail on the head with her tablescape. 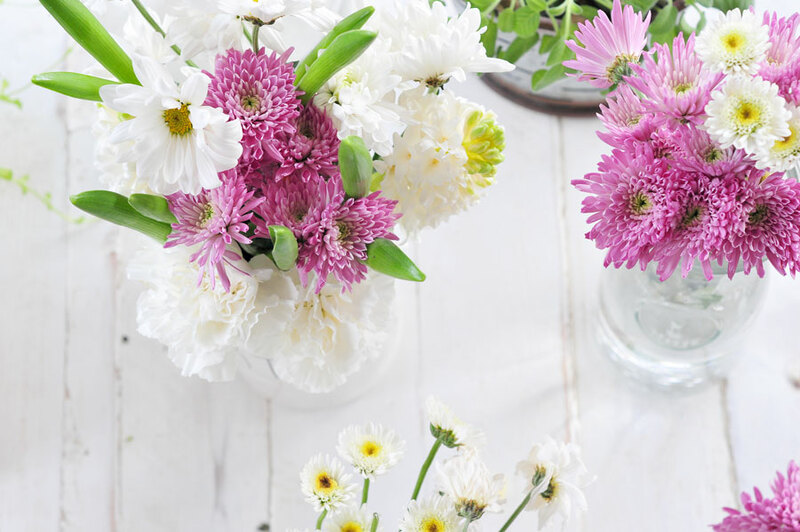 We have to look for things that are manageable with kids, and this centerpiece is perfect! You can find wood crates at any thrift or vintage store (or you can make your own! ), fill them with flowers or, my personal favorite cabbage and kale plants, then use mini pumpkins and heirlooms (found at Lowes, any garden center or Kroger/Walmart type stores) to add depth. That’s it! Easy, inexpensive and very low maintenance. 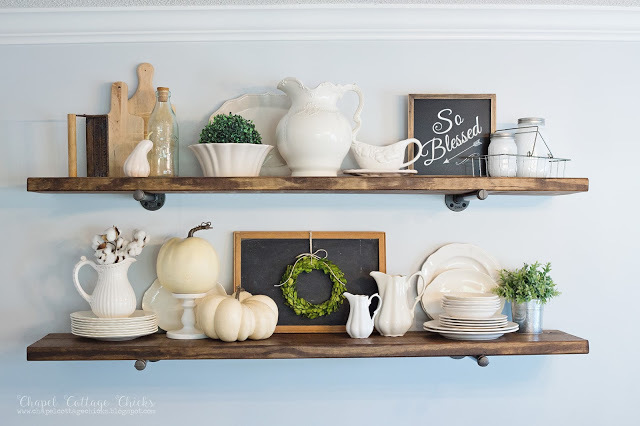 One of the easiest ways to decorate for any season is by setting up vignettes throughout your home, which are basically just small displays on surfaces like end tables, shelves and coffee tables. There are tons of free printables out there that you can download and put into frames. 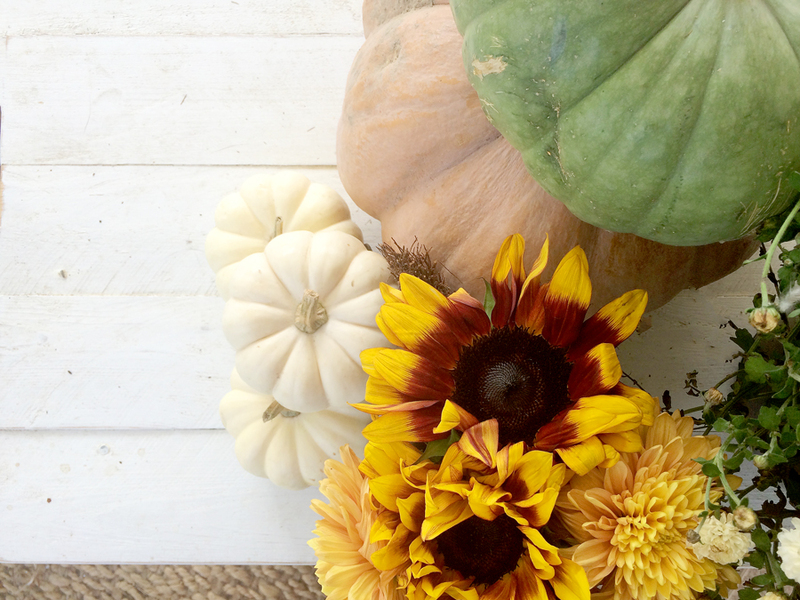 Make your own DIY wood signs for fall, use mums and pumpkins, cotton stems, jars, wood crates, lanterns, books, candlesticks… the possibilities are endless! 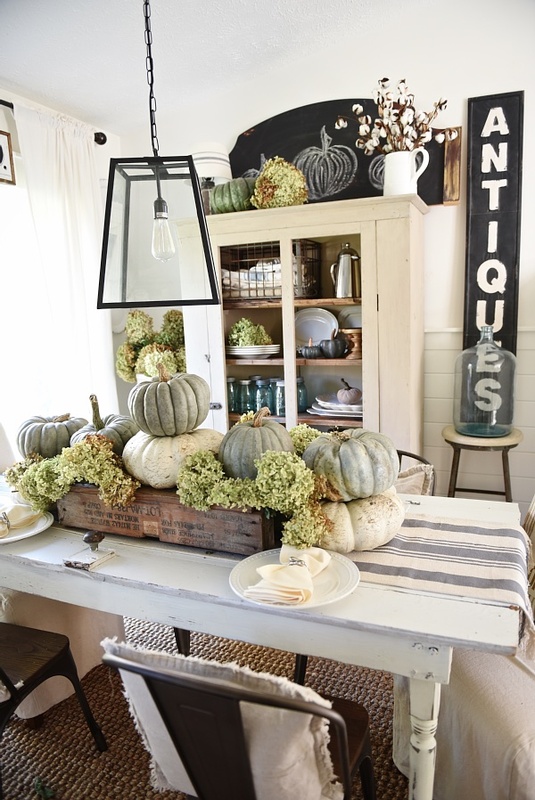 Here are some of my favorite fall vignettes! 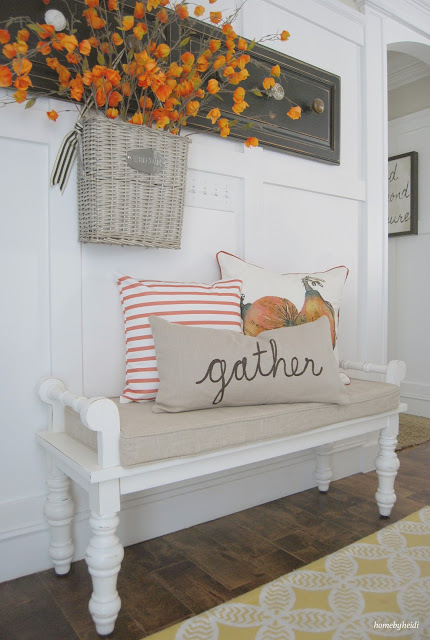 For more of our favorite fall spaces and decor, head over to our Pinterest page, and be sure to check out our fall front porch decor!